Adones Cabalquinto of the Philippines is scheduled to face Qudratillo Abduqaxorov of Uzbekistan on July 23, 2016 at Far East Square, Singapore. They will fight for the vacant WBC Asian Boxing Council Silver welterweight title. Adones Cabalquinto is a 27 years old boxer from Kapalong, Davao del Norte, Philippines. He has a record consisting of 23 wins including 15 victories by way of KO and has 1 defeats. Cabalquinto is a hard hitting boxer and known for his left hook. He is a former Philippine super lightweight champion. This will be his 2nd time to fight outside the Philippines. He was once fought in China where he knocked Gao Yan Qing in round 6th. Cabalquinto only lost to Al Rivera via KO last year. 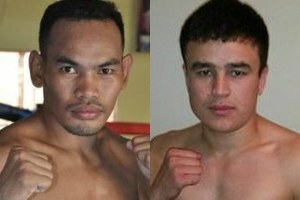 On the other hand, Qudratillo Abduqaxorov is a hard hitting prospect from Qorgontepa, Uzbekistan. He has an undefeated record consisting of 7 wins including 5 by way of KO. At his young age and in his young career Abduqaxorov already won an Uzbekistan welterweight and the World Boxing Foundation International welterweight title. Abduqaxorov won also his last fight via Unanimous Decision against Larry Siwu last June 10, 2016.